Find Better Ideas, Faster ® with a custom portable snacking trend report, our PRO Dashboard and 80+ categories of premium trend reports. The Portable Snacking Trend Report analyzes various travel snacks being used by today's busy and time-pressed consumer. The report looks at different travel packaging like tubes, boxes and bowls that are most convenient and attractive. 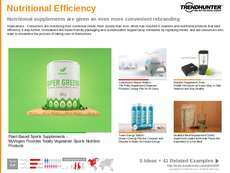 It also provides research on the snacks themselves and what consumers want from their portable food, whether that be nutrition, flavor or hydration. 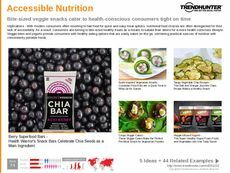 Finally, it looks at various demographics and the differences in their needs from children's snacks for school to a Millennial man's post-workout portable snack. The report is geared to food and snack brands, grocers and nutritionists to give them direction on what patterns and trends are most well received and successful in travel snacks and on-the-go eating. It's an excellent resource for ad agencies, marketing companies and packaging designers to learn about marketing for the busy consumers who needs a portable snack to take to school, work or the gym when they are tight for time. 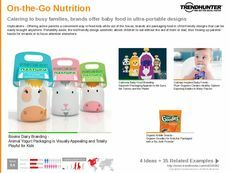 The Portable Snack Trend Report features information on branding, packaging and types of travel snacks and the corresponding differences in the popular patterns of each for various demographics of on-the-go eaters.